The North Carolina Gold Rush. First Gold Discovered in the U.S. The first gold discovery in the United States occurred in North Carolina in 1799 at the now famous Reed Gold Mine. The best known records indicate that this first discovery belongs to a 12-year-old boy named Conrad Reed, son of a Carolina farmer named John Reed. The young boy went fishing one day along Little Meadow Creek, located on their family farm in Cabarrus County. While fishing along the creek, young Conrad spotted an unusual yellow colored rock shining in the water. He waded into the creeks and brought the “rock” home to his father. John Reed had no knowledge of gold, and had no idea that his son had just discovered a huge gold nugget, the first ever discovered in the U.S. Although intrigued by the interesting find, it remained unidentified and little attention was given to it. The interesting “rock” was used as a doorstop for the next three years. It weighed approximately seventeen pounds, and was said to be shaped like a flatiron. Finally in 1802, John Reed took the rock to get it identified. He first brought it to William Atkinson, a silversmith in nearby Concord, North Carolina. Strangely, he was unable to identify the stone as gold. He then took it to a jeweler in Fayetteville, who identified it as a genuine gold nugget. He asked John Reed to leave the nugget with him so that it could be smelted. When Reed returned a short while later he was shown a gold bar that measured roughly six to eight inches long. He asked the jeweler what a good price would be to sell the gold for. They agreed on a price of $3.50, which is estimated to be less than a thousand times its actual worth. Nonetheless, having no knowledge of the real value of his discovery they agreed on the price. Eventually, John Reed learned how valuable his discovery actually was and he explored his property for more gold. He initially explored Little Meadow Creek, where his son had found that first nugget several years prior. During the summer when the creek would dry up, Reed and several partners, as well as several slaves that they owned would dig the creek bed in search of more gold. That following summer they uncovered significant amounts of placer gold, including a 28-pound nugget. They expanded their search and added started several lode mines in the areas as well. This site is now known as the Reed Gold Mine, the first documented location of gold found in the United States. This discovery brought hoards of people into the hills of North Carolina in search of more gold. The Reed Gold Mine happened to lie on what became known as the Carolina Slate Belt, a geological region that spans across the center of the state, and resulted in an explosion of mining activity during the early 1800’s. For a period of time, mining was second only to farming as an industry within the state. Early on during the gold rush, the majority of the gold was found by placer mining, and much of the mining was done by farmers and other residents of the area, although immigrants came from all around the world to search for gold. As the best placer grounds were worked out, many lode mines began popping up throughout the state. For over 20 years, North Carolina was the only producer of domestic gold in the nation. In later years, gold was found in nearby South Carolina, Virginia, and Georgia, which are all partially covered by the Carolina Slate Belt. Hundreds of gold mines operated throughout the region for many years. Rich lode gold deposits were exploited for several decades. Then in 1849, word of the major gold discoveries in California caused many of the miners to uproot and head west in search of richer ground. The expansive goldfields of California were unlike any prior gold discovery, and certainly overshadowed the gold mining opportunities in North Carolina. While gold mining continued there, many of the mines were abandoned and scaled back significantly. Other gold discoveries throughout the west attracted more and more men away from North Carolina in search of richer gold ground. Although gold mining in North Carolina has never gotten back to its heyday of the early 1800’s, there are still many mines operating in the state. Recreational prospectors can still find gold in many of the creeks that yielded gold over 200 years ago. 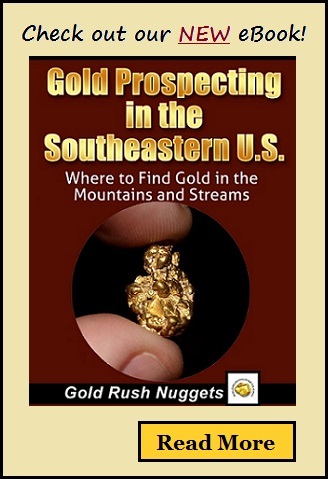 Want more information about gold prospecting in North Carolina?